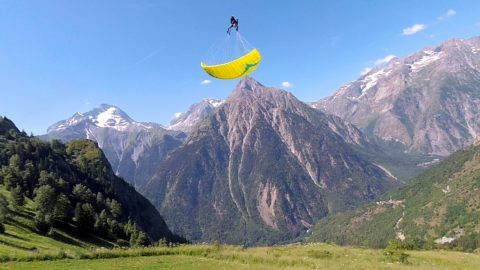 The UFO (Ultralight Flying Object) of Air Design is a single surface wing (without intrados) intended for hike & fly, mountaineering and expeditions flights. It is available in 14 m² – 16 m² – 18 m² and 21 m². Sizes 18 and 21 are approved for EnC and EnB respectively. Knowing that we like small surfaces, we wanted to test the 14 and 16 m². The three lines risers are made entirely of dyneema. Lightweight and streamlined, they are equipped with an accelerator. We regret the absence of trims, especially for small sizes. 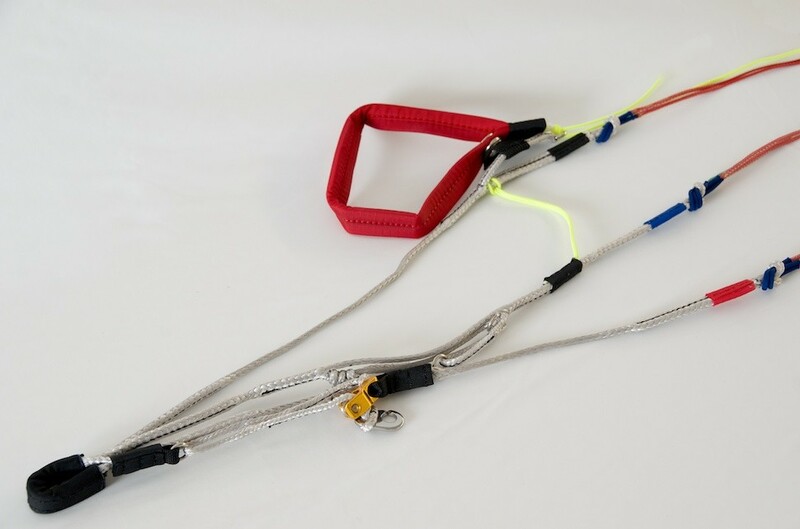 The dyneema risers are very flexible, and to avoid tangling during preparation in delicate conditions, it may be advisable to leave the harness connected to the wing. The line configuration is very simple and short in length, a little bit like a mini sail, the untangling is therefore very easy. The lines are made of unsheathed kevlar, anti-UV treated and have a large diameter which guarantees good durability and reduces the risk of knots. The tissue used is PORCHER 27 g, double-coated for the sail, and hard finish to prevent deformation on the inflatable pins and ribs, which are more stressed. A smart construction that offers an excellent balance between weight and durability. 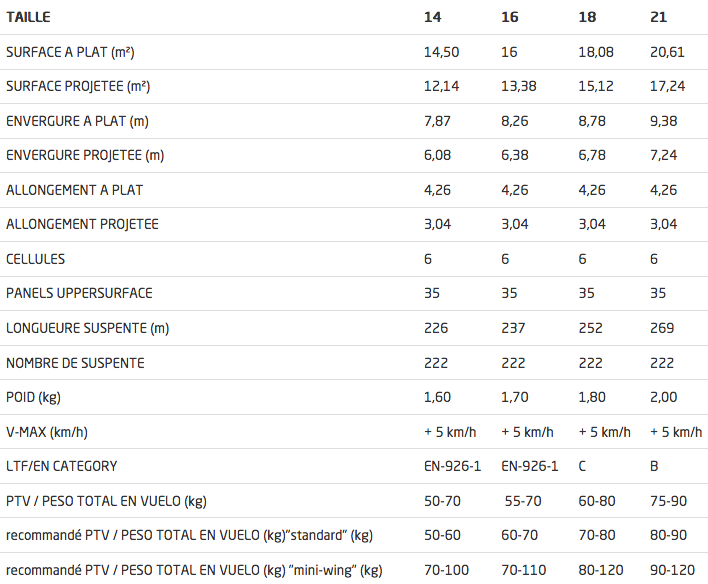 With less than 1.6 kg checked on the scale for the 14, we almost have the lightest wing on the market! 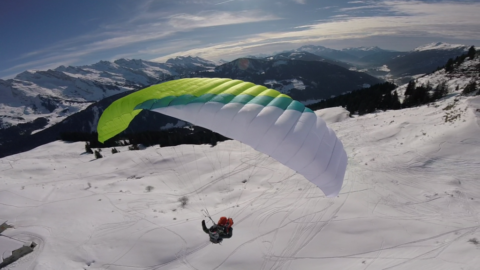 The aspect ratio of 4.26 makes it a safe and accessible wing. So accessible that it is used in flying school by the FLYEO team in Annecy. 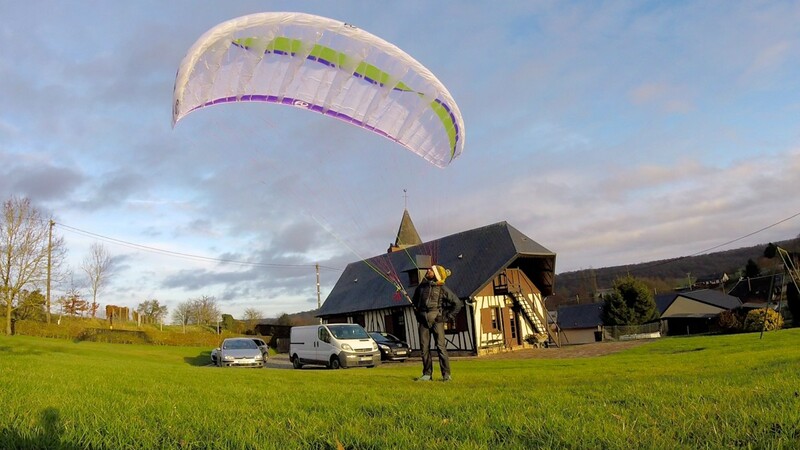 Inflation without wind or even a slight tailwind is amazingly easy, the wing rise quickly and effortlessly, it is not even necessary to attend the front risers and it is even better not to be brutal to avoid a too quick rising , even if it does not tend to overtake. Thanks to its short line, recentering is almost unnecessary and you can enjoy inflating or even taking off without touching the controls! 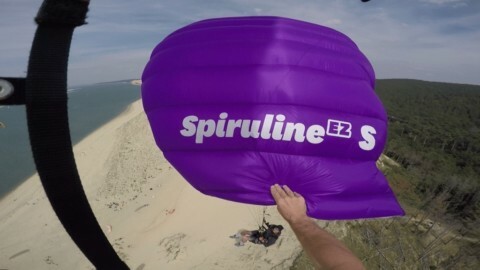 In the sustained wind, you may find yourself in the air faster than expected if you do not put the sail in a balloon so that it does not inflate itself. Being very light, it tends to inflate in an untimely way. In case of strong wind, it may be advisable to prepare the leading edge wing facing the ground and to turn it over in inflating at the last moment, a bit like the “Cobra” method. The take off is also exceptional, and it is there that we understand its interest in high mountains, in addition to its low weight and compactness of course. 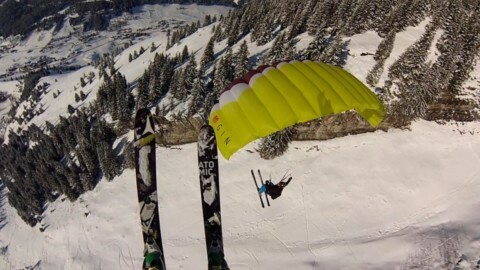 The mono-surfaces are famous for their excellent take off, and for good reason: barely the start of the run-up started, you already feel carried by the wing and you find yourself in flight very quickly. This characteristic combined with an excellent inflation, make it a formidable weapon to take off from improbable or very short places and of course in high mountains. 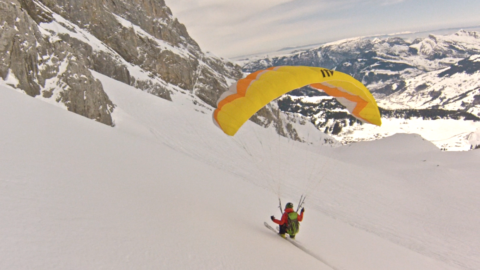 Keep in mind that in high mountains, low lift and snow do not facilitate take-offs without wind or with a a slight tailwind. The roll is well present under 14 and 16 and, combined with a fairly short travel at the brakes controls, gives the feeling of being under a rather playful mini-wing. However, it is difficult to make big wing-overs or barrel-rolls, because the damping inherent in single-surfaces limits the extent of manoeuvres. 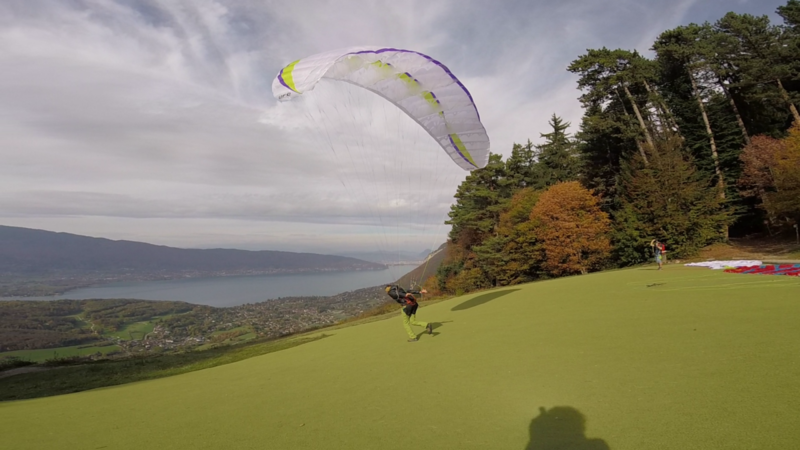 It’s neither an acrobatic wing nor a speedflying wing, so we don’t blame it and there’s still plenty of fun to enjoy the descent after the long hours of hike or mountaineering that preceded the flight. The pitch, which is already very low on mono-surfaces, is almost non-existent under the UFO due to its short lines. It’s funny and reassuring to send out big 3-6 candlelight releases and to see that it’s useless to make any tempo! It seems very difficult to fault this UFO, and even if you manage it, the behavior remains very safe for such small surfaces. However, there is a tendency for stabilos to collapse during manoeuvres, but this is of no consequence. In the air, the UFO – like all ultra-light wings – transmits all the small information that passes through, which makes it possible to skillfully exploit any thermal or dynamic. At first, you have the impression that the wing transmits too much, but you quickly realise that the movements are without amplitude. In thermal, the UFO is not the best performing. But we still find ourselves exploiting small conditions, even when flying with a large wing load. 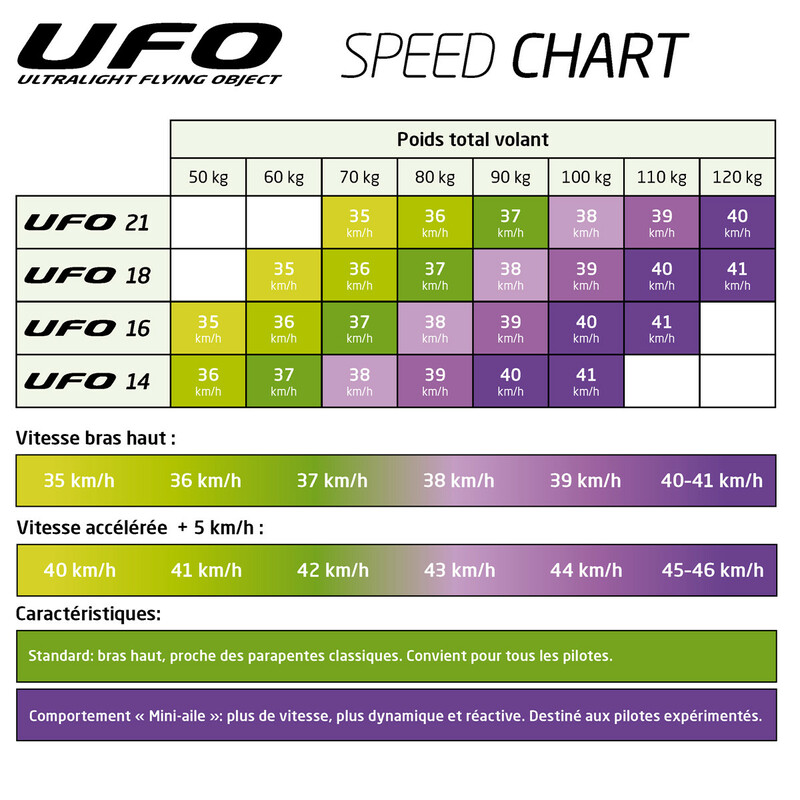 Low speed is often the weak point of mono-surfaces and the UFO does not deviate from the rule. This is why, depending on the intended use, it will be preferable to have a fairly high wing load, especially since the speed-bar gain is not huge. We are still approaching 40km/h under the 16 for a PTV of just over 80kg, which still leaves a lot of room for manoeuvre. The landing is the other negativ spot of mono-surfaces. The pitch surge being very weak, if not non-existent, the landing is often made of a step a little heavy and with a slight race. Nothing extreme though, it is more of a habit to take than anything else. FLYEO internship students don’t crash every time they land, so you should get out of it. But forget the long swoops! Choose a long straight end and start rounding early enough to use the full travel of the control brakes. The UFO is indeed something very different that what we're used to see. Fun but so accessible that you can put it in the hands of a beginner. We like its mini-wing feeling, even if its lacking character to make it a speedflying wing. A wing made to descend from the mountain, but not only. We will gladly slip it into the bottom of our bag at every occasion, just in case! id, et, Lorem consectetur commodo risus.